The Light Rail Plays, conceptualized and performed by a partnership of youth and professional actors, were designed for riders, passersby and scheduled audience members alike. Passenger? Commuter? Theatergoer? It’s one in the same for the light-rail riders of Valley Metro in Arizona. 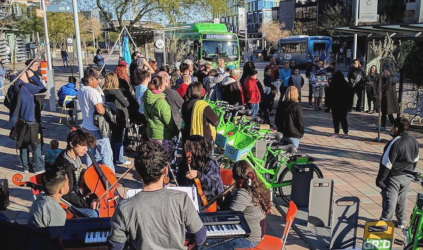 The five-minute, two person original plays — underscored by live music from The Harmony Project, a music education and social support organization for youth — were performed for riders throughout the light rail plaza and Tempe Transportation Center (TTC) in Arizona, which is also home to several bus lines and bikeshare stations. The partnership began when the theater group reached out to Valley Metro officials in 2014 to highlight arts and culture in the community, Hoffman said in an email. The plays were originally performed on Valley Metro light-rail trains and on platforms between the Roosevelt Street and Camelback Road stations along Central Avenue in Phoenix. This year — the sixth season of the performances — the theater company made its home-base the platform of the Veterans Way/College Avenue light-rail stop in Tempe, Arizona, for a weekend in mid-February. An arts grant from the city of Tempe allowed the company to rent practice space in the TTC building next to the light-rail plaza, in the five weeks leading up to their performances. The production started with a call for adult and youth artists. Following auditions, seven youth performers and seven adult performers were chosen and paired up to create one performance each for a total of seven performances. The entire production team is made up of youth and adult musicians, designers and stage managers. The performances held during the weekend of Feb. 22 were free. Youth and professional actors collaborated to conceptualize, write and perform unique plays with riders, passersby and scheduled audience members in mind. Each performance attracted a mix of audience members. Half of the crowd were “walkups,” while the other half had reserved tickets online, said Sarah Sullivan, co-artistic director of Rising Youth Theatre. Although tickets were not required, 355 tickets were reserved to view the performances this year. The tickets served as more of an RSVP for “intentional” audience members, giving them details on performance start times, precise locations and parking instructions. Sullivan explained that before “The Light Rail Plays” was conceptualized in 2014, the Rising Youth Theatre company performed plays in a traditional theater space. But situation limited the audience to community members who already were comfortable attending live theater. By holding performances in a public space, “The Light Rail Plays” provided an opportunity for the company to reach more audience members, including those who are not regular theatergoers.